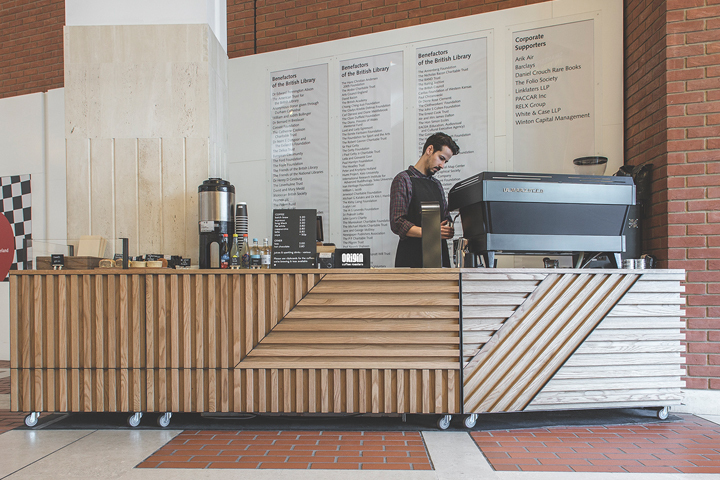 In the front hall of the prestigious British Library is our pop up coffee cart for Origin Coffee Roasters. Briefed to create a system that could be flexible (and at times removable) yet have a sense of permanence in this outstanding location was our challenge. The cart houses all equipment in carefully proportioned mobile units that are then clad with a distinct and beautifully crafted panel system in oiled oak and blackened steel. The ethos and brand of Origin Coffee Roasters is reflected in the honesty and execution of materials and balanced against the surrounding architecture.